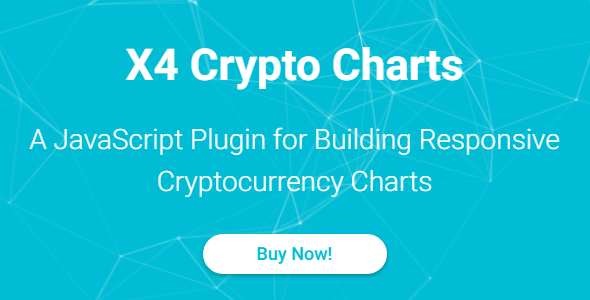 X4 Crypto Charts plugin retrieves cryptocurrency data such as coin price, volume and market capitalization using CoinCap.io API and then displays that data on the different types of charts such as Line type and Bar type using Chart.js library. Tons of settings allows you to change every pixel in the charts including chart type, chart height, set of coins, fiat currency, time period, coin property, chart background, chart thickness, chart smoothness, chart colors, crosshair, watermark, tooltip, legend, scales, grid etc. Review the examples to see all the power of X4 Crypto Charts and a large set of different options available for customization. The charts are fully responsive and mobile ready, works perfect on desktops, tablet and mobile devices, including full screen mode. Highly Customizable. Full-featured charts, tons of settings allows you to change every pixel in the charts. Line Charts. A line chart is a way of plotting data points on a line, it is used to show trend data. Bar Charts. A bar chart is a way of showing data values represented as vertical bars, multiple data sets. Milti Coin Charts. A multi chart provides a way of showing the comparison of multiple data sets side by side. 160+ Fiat Currencies. A large set of fiat currencies to select with cryptocurrencies, such as USD, EUR, GBP, RUB etc. 7 Time Periods. Select different time periods such as 1 day, 7 days, 30 days, 90 days, 180 days, 365 days, all time. 3 Crypto Properties. Select different properties to display such as coin price, coin volume, coin market capitalization. Smooth Charts. Select the different levels of smoothness such as 1 (detailed) to 100 (very smooth). Detailed Charts. Select to display the detailed chart with up to 1000+ values at the same time, full screen. Additional Controls. Select to display additional controls such as tooltip, legend, watermark, crosshair etc. Customize Colors. Select the colors of any control on the chart, including coin lines, bars, and font color. Customize Fonts. Select the font family, font size, font color to display on the scales, tooltip, legend and watermark. Values Template. Use the value template string line to customize the output of values on the scales and tooltip. Values Formatting. Use value formatting options such as rounding factor, thousands separator, and precision.